Organizing initiatives from the top of an organization may seem like a simple task, especially while using continuous improvement to carry out projects and improvements. Mark Graban of leanblog.org and the KaiNexus VP of Innovation and Innovation Services, explains on the latest KaiNexus webinar how Lean and strategy deployment go hand in hand. Check out the whole presentation here. Many people think that Lean is just another tool in the process improvement toolbox, but there's much more to it than that. As with an iceberg, there is so much below the water that we can’t see. 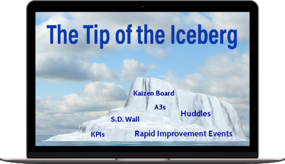 The A3s, PDSA, Kaizen Boards are, well, just the tip of the iceberg. Below that, though, lies the ideals and principles such as strategy deployment that drive and support the entire improvement culture. Strategy deployment, also known as Hoshin planning or Hoshin Kanri, was developed by Dr. Yoji Akao at a Japanese joint venture with Hewlett-Packard. (Hoshin means compass, and Kanri means management or control.) This concept is used to align the efforts of an organization in working toward common goals. 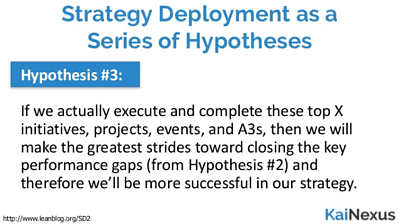 Really, strategy deployment is quite the opposite, taking into account the process as well as the results. Understanding feedback loops plays a critical role in strategy deployment, as does engagement of staff on the front lines; leaders of effective strategy deployment know that the best ideas for improving performance gaps tend to come from the bottom up. In this way, strategy deployment is a combination of top down and bottom up efforts. 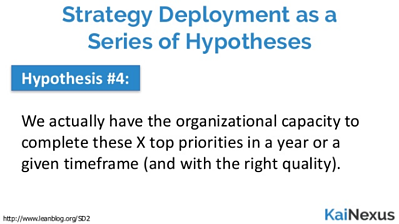 Strategy deployment is based on a four-step hypothesis that focuses on the long term, whether that be annual cycle or 3-5 year cycles. Those that are familiar with Lean will see that it is similar to A3s and problem solving tools, but on a much larger scale. You should expect to get some push back from staff regarding goals - this is normal, and even productive, as the ensuing discussions will create deeper alignment within the organization. One tip for getting through this phase is to not worry so much about the precise number of your goals; instead, focus more on the direction you’re working toward. Why are we improving or not improving? Were the goals that we picked the right goals? Do we need to change our goals? These questions are important to evaluate the process and figure out how to improve and close performance gaps. One of the keys here is to not have too many high priority projects. If everything is labeled as high priority, then nothing is. Having the courage to decide not implement everything at once is also important. Don’t be afraid to put some ideas on hold and save them for later when they can be of higher priority. Err on the side of too few key initiatives rather than too many so that you have more energy to devote to the projects in progress. This will ensure that your projects are more successful in closing the performance gaps. If there are too many high priority projects, then most likely the organization will not have the capacity to complete them in the proposed time frame. Having the capacity to actually finish these priorities is just as important as creating them. We saw earlier that there is different thinking between goal-orientated management and strategy deployment. 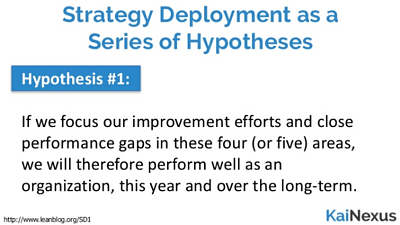 Strategy deployment is about the “why,” Did we do our process right but get poor results? Did we do it incorrectly but get the right results anyway? Why did these things happen? Getting to the root of the problem is an important part of the process. To review we need to take a step back. We have created the correct True North categories and we have the right metrics to analyze these categories. We have the correct initiatives to fix the gaps and we have the right capacity to execute these initiatives in our True North categories. 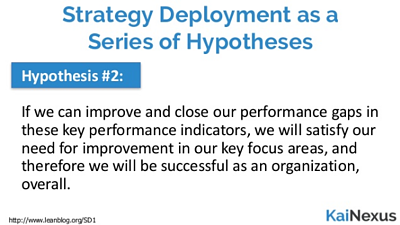 Following these step by step hypothesis will lead to proper strategy deployment throughout the organization and will further the your organization in the difficult continuous improvement journey. Want to learn more? Watch the full webinar here!